Completed in a warm, marked Tobacco finish, this three piece occasional table set will outfit your home with functional storage and display for your living room. Two coordinating end tables and a cocktail table with casters, a lower shelf and an outer raised lip. 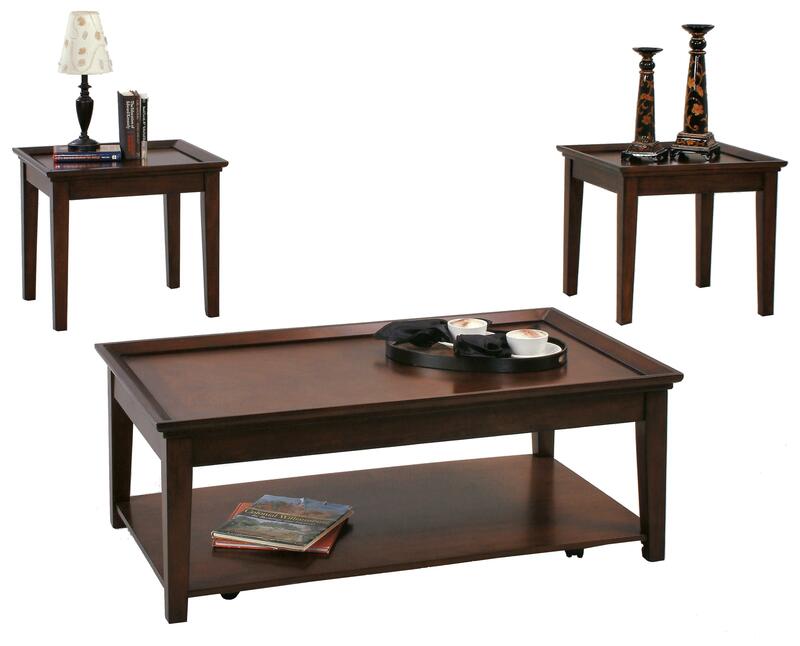 Complete your living room with this traditional, stylish, and functional occasional table group. The Encore 3 Piece Occasional Table Set with 2 End Tables and 1 Cocktail Table by Progressive Furniture from Boulevard Home Furnishings. We proudly serve the St. George, Cedar City, Hurricane, Utah, Mesquite, Nevada area. Product availability may vary. Contact us for the most current availability on this product. Finish & Paint Options Warm Tobacco Finish. Case Detail Smooth, clean, geometric lines. Cocktail table features caster wheels. Description: Top Inset basin table tops. Case Construction Wood veneer and solid case wood construction.